Traditionally, scientists thought that star-shaped brain cells called astrocytes were steady, quiet supporters of their talkative, wire-like neighbors, called neurons. 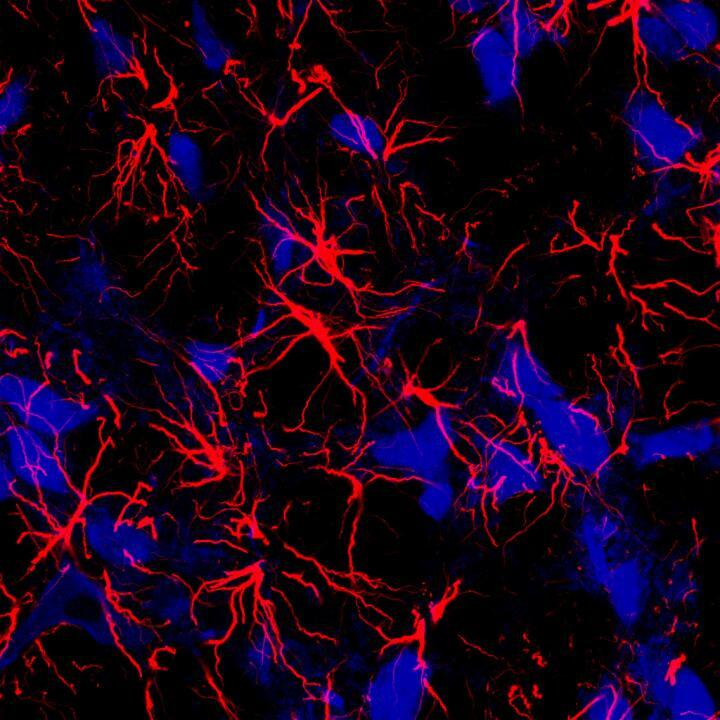 Now, an NIH study suggests that astrocytes may also have their say. It showed that silencing astrocytes in the brain's breathing center caused rats to breathe at a lower rate and tire out on a treadmill earlier than normal. These were just two examples of changes in breathing caused by manipulating the way astrocytes communicate with neighboring cells. "For decades we thought that breathing was exclusively controlled by neurons in the brain. Our results suggest that astrocytes actively help control the rhythm of breathing," said Jeffrey C. Smith, Ph.D., senior investigator at the NIH's National Institute of Neurological Disorders and Stroke (NINDS) and a senior author of the study published in Nature Communications. "These results add to the growing body of evidence that is changing the way we think about astrocytes and how the brain works." Dr. Smith's lab investigates how breathing is controlled by the rhythmic firing of neurons in the preBötzinger complex, the brain's breathing center that his lab helped discover. For this study, his team worked with Alexander Gourine, Ph.D., professor at University College London (UCL), whose lab found that astrocytes in neighboring parts of the brain may regulate breathing by sensing changes in blood carbon dioxide levels. At least half of the brain is comprised of cells called glia and most of them are astrocytes. Recently scientists have shown that astrocytes may communicate like neurons by shooting off, or releasing, chemical messages, called transmitters, to neighboring cells. In this study, the scientists tested the role of astrocytes in breathing by genetically modifying the ability of astrocytes in the preBötzinger complex to release transmitters. When they hushed the astrocytes in rats by reducing transmitter release, the rats breathed and sighed at a lower rate than normal. In contrast, if they made the astrocytes chattier by increasing transmission, the rats breathed at higher resting rates and sighed more often. The team also tested how silencing astrocytes affected the rats' responses to changes in oxygen and carbon dioxide levels. Although the rats' breathing rate increased when oxygen levels were lower or carbon dioxide levels higher, it was still lower than normal. Silencing astrocytes also decreased the rate at which the rats sighed under lower oxygen levels. Moreover, the rats became exhausted much earlier than normal. They could only run half the distance that normal rats could run on a treadmill before tiring out. "The primary goal of breathing is the exchange of carbon dioxide and oxygen that is critical for life. Our results support the idea that astrocytes help the brain translate changes in these gases into breathing," said Shahriar Sheikhbahaei, Ph.D., formerly a doctoral student at UCL and participant in the NIH Graduate Partnership Program, and the lead author of the study. Finally, the team showed that these astrocytes used adenosine triphosphate (ATP) to communicate with other cells in the brain. Inactivating released ATP reduced resting breathing rates and the frequency of sighs under normal and low oxygen levels. "Our results expand our understanding of how the brain controls breathing under normal and disease conditions," said Dr. Smith. "We plan to follow this path to understand how astrocytes help control other aspects of breathing." This study was supported by the Intramural Research Program at the NINDS, the Wellcome Trust, British Heart Foundation (Ref. RG/14/4/30736), BBSRC (Refs. BB/L019396/1, BB/K009192/1), the Medical Research Council (Ref. MR/L020661).